Last month, on a Wednesday afternoon, the Baltimore Orioles and the Chicago White Sox played a game in an empty stadium. Baltimore was still a cauldron following the funeral of Freddie Gray, a 25-year-old African American man who died in police custody. Fearing further violence, city officials shuttered Camden Yards. The teams played their nine innings in a surreal silence; Orioles manager Buck Showalter said he could hear the bullpen phone ring from his own dugout, more than 400 feet away. Major league games had been postponed before due to security concerns. But no one could remember an instance where teams had met behind closed doors. There is a precedent, however, in cricket–baseball’s noble ancestor and the world’s second most popular sport. 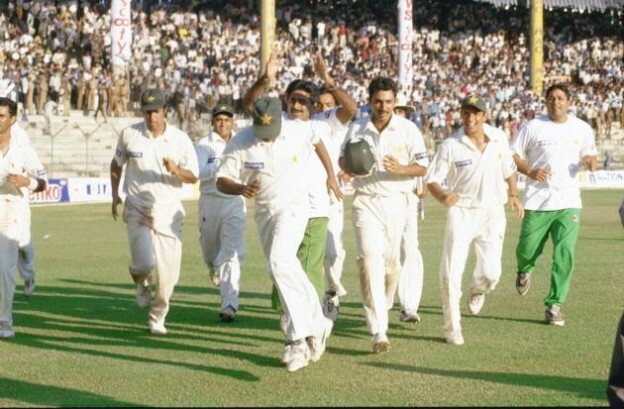 On February 16, 1999, teams from India and Pakistan took the pitch for a five day cricket test match in Kolkata, India. It was a delicate and dangerous time. India and Pakistan had both detonated nuclear devices the year before. Armies were massing along the border. In a hail mary for peace, Pakistan sent its best ambassadors—its cricket team– to India for a tour of five test matches. Cricket diplomacy had worked in the past. And it appeared to be working in here too. Indian fans in Chennai gave the Pakistanis a standing ovation during the visitors’ victory lap after they trounced the home team in game two. Hindu nationalist thugs dug up the pitch in Delhi a few days before the match there. But the match there also went smoothly. Things were different in Kolkata. India’s skillful spin bowlers held Pakistan batters to a meager 26 runs over the first three days. The crowd, composed largely of Indians, was encouraged. Then something happened on the field. Sachin Tendulkar, India’s best batsman, stepped out of the crease to avoid a charging Pakistani fielder. A once in an incarnation throw from deep in the Pakistani outfield somehow caught the unguarded wicket. 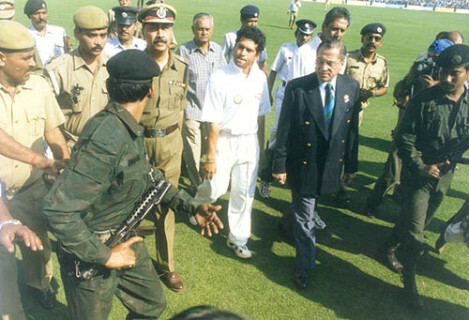 Tendulkar was called out. The 100,000 fans at Kolkata’s Eden Gardens showered the field with bottles and coins and trash. Repeated calls for order were ignored. 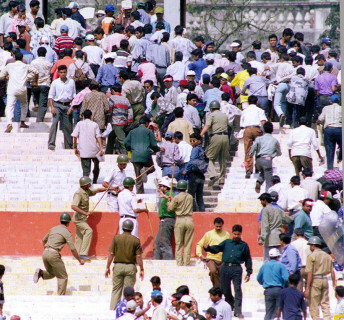 Eventually, the spectators were escorted out of the stadium. And the remainder of the match between sport’s greatest rivals was played before an empty house. “It was like the Bolshoi performing the final scenes of Swan Lake watched only by the guy waiting to lock up the theater,” said one observer. Despite the bitter ending, two days after the Kolkata match leaders from India and Pakistan signed a historic declaration in Lahore, Pakistan. The accord committed both countries to seeking a peaceful means to resolve their differences. Then, three months later, Pakistani-backed islamist troops occupied an Indian position in the disputed Kashmir region, sparking the fourth India-Pakistan war. India-Pakistan cricket is a rivalry like no other. The game is played everywhere, on manicured lawns and makeshift pitches and dank urban alleys. Both countries shut down when their teams face-off—an electric silence broken only by a communal television commentary that seems to hover above the subcontinent. It is a rivalry charged with decades of hostility, espionage, and mutual distrust. But it also a competition that reminds the two feuding neighbors that they have more in common than most brothers do. One of those things is cricket, a sport that reminds Indians and Pakistanis of their shared heritage, their shared passion—and their shared hope that they might settle the better part of their differences on the playing field. This entry was posted in Ken's Blog on May 12, 2015 by Ken Shulman.